Here is a list of simple sleep habits that can help to improve the sleep quality and overall wellbeing of your infants, toddlers, children and teens (and parent(s) too). Setting a schedule: One of the most important things to good sleep hygiene is getting up and going to bed around the same time each day. This means even on weekends or days off, starting with infants and continuing through all ages! It is important to understand, especially with infants and toddlers, that our little ones are more likely to self soothe to settle back to sleep during the night if the 2 am sleep environment is the same as the bedtime environment. In other words, infants and toddlers are less likely to fall back to sleep if they are first falling asleep in the living room, rocking chair or parents room and being moved to their own sleep area after they are asleep. They are more likely to fall back to sleep in the night if their bedtime routine ends in their own sleep area while they are still awake, just before they fall asleep. As your children move through their older childhood years and into the teen years, it’s often helpful to avoid napping during the day, but if they must nap, keep it to a maximum of 30-45 minutes and before 3pm (or right after school). Avoid caffeine (in chocolate and soda, for example), heavy, spicy or sugary foods 4 to 6 hours before bedtime. These stimulate our bodies and impair our ability to fall asleep. Find a comfortable temperature setting, our bodies like a cool but not cold bedroom for sleep. 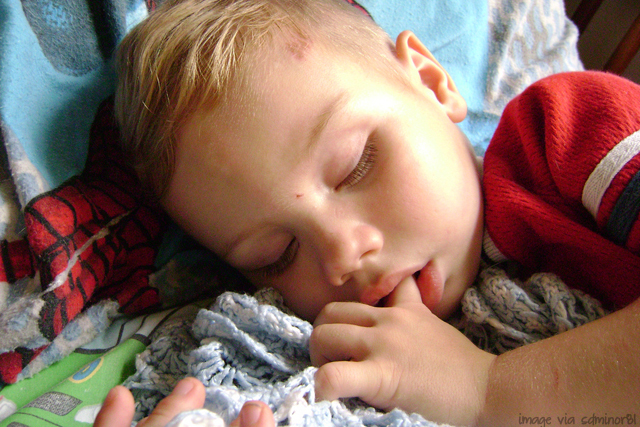 It may be helpful to reserve your child’s bed for sleep, and nothing else. This helps our body not to associate bed with anything other than sleep. Begin rituals that will help your child or teen relax each night before bed. Some suggestions are taking a warm bath, having a light snack, sitting quietly, stretching or reading. All of these can be worked into creative bedtime routines that will build family memories. Avoid clock watching. This eliminates the mind from thinking “Oh my, look how late it is and I am still not asleep.” As your child gets older, it may be helpful to temporarily remove the clock from his or her room, or turn it so the clock face is not visible from the bed. Eating right. A healthy, balanced diet can help sleep. Here’s to a good night sleep, and a houseful of refreshed, energized children (and teens!) ready to tackle the day!